Blood, guts, gore- it's precisely what Halloween's good for (plus Halloween candy… especially deep-fried Halloween candy). 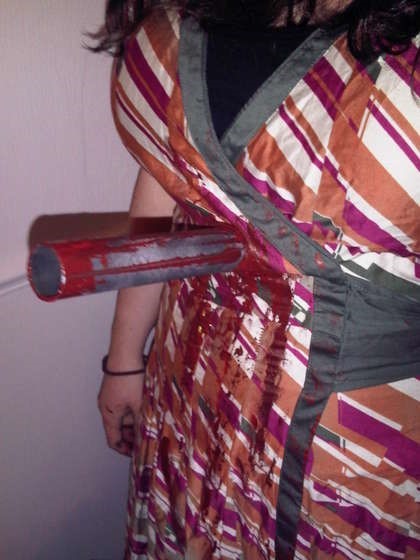 If your running out of time to behead yourself, then try Instructables member gnatquill's "nice effective quicky if you've left it too late for Halloween". Click through for full instructions on creating your own bloody spike, right through the gut. Previously, Halloween HowTo: BP Oil Spill Clean Up Costume. Halloween HowTo: Give Your Trick-Or-Treaters a Heart Attack With Deep Fried Treats. Go Gaga for Halloween! Top 10 Lady Gaga Looks.